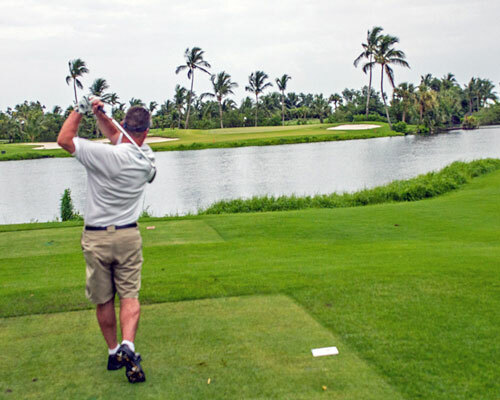 The Ocean Club golf course is for the avid golfer and is a course you’ll have to experience when on Paradise Island in the Bahamas. Designed by Tom Weiskopf for some people it is expensive but if you are an avid golfer then you have to find a way to play the course. One way might be to play later in the day when the temperature is cooler and the green fees drop significantly. Believe me you will not be disappointed. Looking for a safe spot to land on the green. 1. It is really well maintained and wide open so the chances of you losing your ball are going to be difficult. And yet the course is very challenging, for example the par 4 hole number 4, it’s demanding because your second shot will be to the green slightly downhill and protected by the ocean to the right and behind with a bunker on the left. Then there is the long Par 3 hole 12, 208 yards from the back. As you stand in the tee box you’ll notice the beautiful natural wetlands which surround the front and back of the greens. I could not avoid them! 2. My second reason to love this golf course was the staff. From the time you arrive at the club until they make sure your transportation is ready to take you back to your hotel, the staff made the time at the course relaxed and mellow. There was ice and towels in our cart, And believe me that was very much appreciated. 3. My third reason to love the Ocean Club is the scenery. One thing is for sure there will be times during your round when you will be distracted, it maybe the celebrity homes. 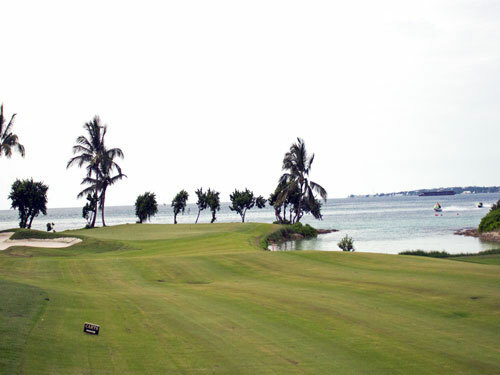 It is hard to concentrate on your golf game when you are surrounded by sapphire blue ocean water, which comes into play on the par 4 hole 17, while it might be the shortest par 4 on the course it plays entirely along the ocean and beach. From the back tees it plays 306 yards, it can play directly into the wind but in the right conditions it can be driven. To that I say “Good Luck” because while the green is large there are many bunkers. I can understand why the Ocean Club golf course is ranked among one of the better courses in the world for an unforgettable round of golf.